If you want more information about anything going on at our church, click the "Contact Us" button. 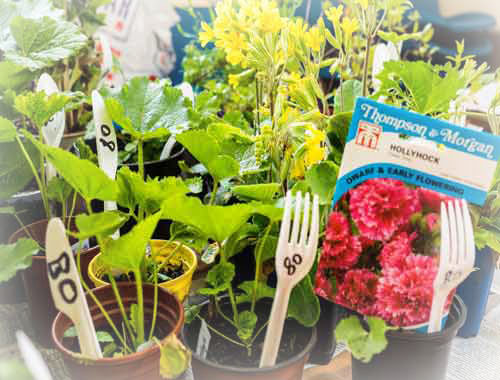 Our annual Plant and Garden Bring and Buy Sale will be held on Bank Holiday Monday May 6th at Hucclecote Methodist Church Hall, Carisbrooke Road, Hucclecote, GL3 3QP from 11am to 1.30pm. We hold this recycling` event every year. Hundreds of people come along to purchase the bargains. We appeal for second hand lawnmowers, garden tools, plants, shrubs anything garden related and have been collecting donations since our last sale in 2018. Nothing at our event is expensive, plants start at 30p as everything is donated. Since 1998 the event has grown and grown...sorry for the pun! and now we have so many people who kindly donate their unwanted plants and garden items every year. Many of our friends sow seeds every year especially for this Sale and their plants are wonderful. We just hope that the cold weather early this month will not effect the number and variety of plants we will have for sale this year. We also have a very unusual entry fee to the event. Entry is free if you bring a plant to donate, otherwise its entry .50p. Where else can you get into an event in Gloucester by donating a plant? Nothing is wasted in this recycling event, we even use old plastic spoons as labels for the plant pots- see the photos above. Jumble can be left in the Welcome on the preceding Friday between 6.00 and 7.00pm or in the hall on the morning of the sale from 9am. Please do not leave Jumble at the Church Centre before the Friday evening.